Here are some terms you may find on your quote. Your regular 3 tab shingle. Asphalt and fibreglass layers. Offered in a variety of colors. Once you have firmed up your plans with us, we will drop off swatches so you will be able to complement your house trimmings as you wish. Shown here in Autumn Brown (taken from the CertainTeed website). Also shown above in the same color. 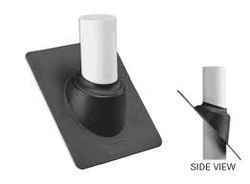 Ice & Water is a membrane and has a plastic backing that is removed prior to installation. It adheres to the roof deck when it heats up (from the sun).The roll is 3' in height and is applied on the deck at the lowest point (just above the eaves troughs). It is also applied to valleys. Just a fancy word for plumbing mat. Sometimes called flashing. It goes around the plumbing stack. The top and sides of the base are covered with shingles so that water runs down the shingle rather than underneath the base of the collar. These never get reused during roof replacement. 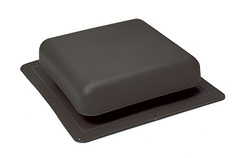 Static roof vents are sufficient and complements any roof. One required for every 350 sq.ft. We prefer them over vents with external moving parts. GAF-Elk RT 65's. Scratch, crush and dent resistent. High impact resin construction; looks good for many years. Laminate shingle (2 layers glued together). More resistent to animal damage, high winds (rated up to 130mph gusts) and driving rains. Shown here in Driftwood (taken from the CertainTeed website). Flashing covers the gap between roof and brick (or siding). We use heavy gage, custom bent prepainted aluminum. Creates a very clean, finished look. Paint will not chip. All prices listed do not include taxes. We all hate them. Our workmanship warranty covers leaks or other workmanship-related issues. We will not take responsibility for animal damage or blow-offs due to high speed winds or other acts of nature. 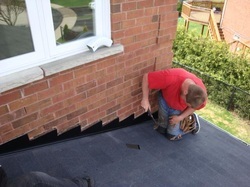 The manufacturer covers shingle blow-offs up to 60mph for 25yr shingles and 130mph for lifetime shingles. Click here to read more about the manufacturer's warranties. We do not ask for a deposit. Pay when the job is done. Cash, certified cheques and money orders are also accepted forms of payment.